Sun Chlorella “A” is a high quality and balanced nutritional supplement rich in various nutrients. 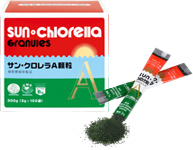 Sun Chlorella “A” contains nutrients in green and yellow vegetable such as essential amino acids, protein, minerals, vitamins, chlorophyll and carotene that are essential to healthy body. Above all, 60% of protein is contained which is not found in most food. And because we use Chlorella pyrenoidosa (SUN CHLORELLA strain) that is cultivated outdoors, our chlorella extract contains much chlorella growth factor (C. G. F.). Our unique and patented technology succeeds in breaking down the cell walls by at 90%, thereby solving the only remaining problem of tough cell walls that hindered digestion and absorption. Hence this product is sure to satisfy not only first-time users, but also those who experienced dissatisfaction with conventional chlorella products or other health foods. Also available in granule form. The certified logo of JHFA on Sun Chlorella "A"
The certified logo of JHFA is permitted to use only for products that have passed through strict examination based on the product specifications and standards. *This table shows an example of analytical value by Japan Dairy Technical Association.